Lily of the Valley's scent cannot be captured to make perfumes. 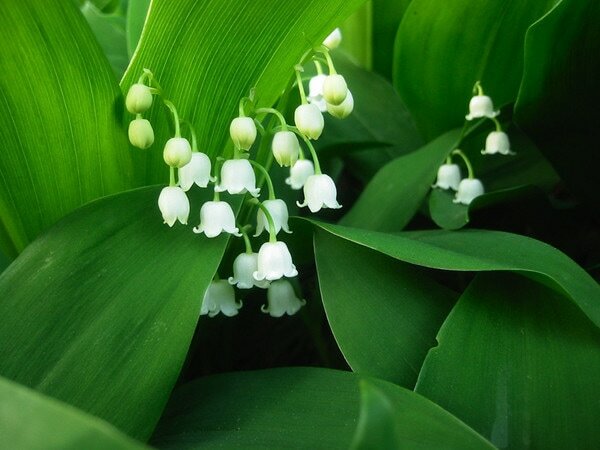 If someone try to sell you a Lily of the valley perfume, know that it will not be natural but it will be synthetic. Around since at least 1000 B.C., lily of the valley plants are one of the most fragrant blooming plants in the spring and early summer throughout the northern temperate zone. The stems are covered with tiny white, nodding bell-shaped flowers that have a sweet perfume and medium-bright green leaves that are lance-shaped, 4 to 8 inches high and 3 to 5 inches wide. This moisture loving plant forms a spreading mass with red seed pods remaining after flowering, which makes lily of the valley attractive after blooming and very carefree. Growing lily of the valley plants is easy, as they will remain perennial. ​Lily of the valley restores happiness after sorrow or loss; good for high blood pressure, breathing difficulties, slows a rapid heart beat and heart palpitations. It relieves fluid retention.